Why Does Anne Boleyn Haunt Us? Who broke the wings of the white falcon? Anne Boleyn’s Downfall: Who was responsible? A Lady’s Fall From Grace! Did the Life and Death of Anne Boleyn make an impact on history? Did the life of Anne Boleyn make an impact on history? Did Anne Boleyn Change History? Did Anne Boleyn Make an Impact on History? – Hell Yes! Did Anne Boleyn’s Death Impact History? Confessions of the Executioner of Queen Anne Boleyn – Wiley Emmett Koon, Jr. The Tudors Season 1 Episode 3 – Wolsey, Wolsey, Wolsey! Mary Boleyn – Mistress of Francis I? Includes 3 Free Reports, Book List and Primary Sources List Please check your spam box if you don't receive a confirmation email. PLEASE NOTE: Your privacy is essential to us and we will not share your details with anyone. Was Anne Boleyn sent abroad because of her scandalous behaviour? Did Anne Boleyn have much to do with Elizabeth? Did Anne Boleyn get sweating sickness? And the winner is …. Was Anne Boleyn charged with witchcraft? Was Anne Boleyn a homewrecker? It’s not too late to book your place on the Anne Boleyn Experience or Executed Queens tours 2019! Mary Boleyn – Is there more to know? Once upon a time, there lived a Princess. She was the eldest child of a most magnificent and charismatic King, and his equally mesmerising Queen. This Princess had several sisters and brothers; all loved in equal measure by their affectionate parents. From the moment of her birth there was much deliberation, with regard to finding a suitable husband for their daughter. It was of importance that the little girl should marry a suitor of equal rank to herself; there were many choices put forward, some of whom were mere children themselves, others being of an age with the Princess’s father. Maturity was not a barrier; an advantageous marriage could bring further wealth to a royal family, and be a way of cementing future fealty to the throne. If the King and Queen had found a husband for their daughter at that time, and a contract been agreed, this little girl’s life could have been so very different. In the event, she ultimately did marry a man who certainly was her equal, though if her renowned father had been given a crystal ball to the future, there is no doubt this union would never have been sanctioned, indeed it would have incurred great wrath. Although the Princess was eventually betrothed to this man, she would have spent most of her young life, knowing he was an enemy of her father’s line. This Princess was Elizabeth of York, and her story is not often told, though she deserves far more recognition, than thus far acknowledged. 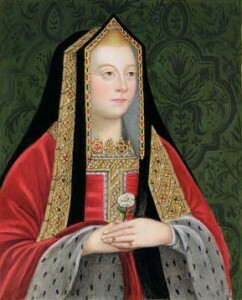 To some people, Elizabeth’s marriage was seen as closure of the terrible Wars of the Roses, when families fought each other as to who had most right to the Crown of England. To others, it represented a new, and some would say, even more appalling set of circumstances, replacing an old and established line with an unknown and unfamiliar supremacy; The House of Tudor. Elizabeth’s mother, and Queen of England, Elizabeth Wydeville, came from a family of known Lancastrian sympathisers, but upon her clandestine marriage with the Yorkist King Edward IV, her family’s fortunes were significantly improved. A large clan, they benefitted greatly from their elevation to the highest echelons of nobility. The change of support to the alternative Royal Claimant did not appear to trouble their consciences too much. Though Elizabeth’s father Edward, was a most engaging and popular Monarch, it did not stop the machinations of his older cousin, Richard Neville, Earl of Warwick, ‘Kingmaker’ who, after helping Edward to the throne, had him ‘replaced’, by his predecessor Henry VI, once it became clear Edward was not going to be the ‘puppet king’, whose strings Warwick intended to pull. Edward only just escaped with his life, alongside his faithful brother Richard, however he had to leave his wife and children behind, forcing them to take sanctuary. Elizabeth would have known great fear, but as the eldest child, needed to support her younger siblings at that frightening time. Luck however, was on the side of the Yorkists, and Edward returned to fight his cause and reclaim his throne, leading to a period of stability and peace within the realm. Of course, this calm could not last. There were always those who felt they could do better, and eyes were constantly watchful for the next opening. Elizabeth has often been referred to as a ‘pawn’, used merely to benefit other individuals’ ambitions; it was agreed at one point she be married to the French Dauphin, an agreement signed in August 1475. It can be assumed she was beginning to come to terms with this situation, as three years later her dowry was settled, and it seemed that everything was going to plan. Unfortunately for Elizabeth, the French Monarch reneged upon the engagement two years later, and her father did not live long enough to punish his treachery. She was in her sixteenth year. Though Elizabeth’s younger brother, Edward, should have acceded to the throne, this was not to be. We all know the tale of ‘the wicked uncle’ who supposedly had his nephews murdered in ‘The Tower’, after having them proclaimed ‘bastards’, following information obtained, that King Edward was already pre-contracted to another woman, prior to him marrying Elizabeth Wydeville. It is said that ‘Uncle Richard’ contemplated marrying his niece, to consolidate his position as King, though how this relationship could have been sustained; bearing in mind the above, takes some believing. One can only imagine what the young Elizabeth might have been thinking at this point, if indeed that was the case. The strange occurrences at that time, namely the disappearance of the Princes, and the hastening once again into sanctuary by the Queen and her other children, could not have endeared the new King to his niece; it is more than likely she would have refused his offer on pain of death! However odd that situation may seem, it is nothing compared to the fact, that even after the disappearance of the princes, ‘Uncle Richard’, proceeded to come to an agreement with Elizabeth Wydeville, that the family come out of sanctuary and return to Court, even advising he would find good husbands, as befitting their rank, for all the girls. They did indeed return to Court, and again one must wonder why the strong and opinionated ex-Queen agreed to this course of action. Was there more to it than meets the eye? We will never know, and this is cause for further conjecture. Elizabeth and her siblings were to all intents and purposes living their lives as naturally as could be deemed possible, until of course history overtook them again. ‘Uncle Richard’ died on the battlefield at Bosworth and Henry Tudor ‘took’ the throne of England, valiantly dating the first day of his reign the 21st August 1485, the battle being fought on 22nd August 1485! And though this story does not have a strictly ‘happy ever after’ ending it is still a tale of a Princess who gave England a magnificent history. Her true name: Elizabeth Plantaganet! I have decided to write the above, very brief account, of the life of Elizabeth of York, mother to King Henry VIII and his sisters. Elizabeth has always intrigued me and I have known her for many years, mostly through my interest in her ‘Wicked Uncle Richard’. I am one of those ‘Revisionists’ who feels that Richard III was merely a ‘man of his time’ and my own personal ‘jury’ is still out on the ‘Princes’ disappearance. Elizabeth has nearly always been cited as a most gentle and loving lady and I agree with that notion. I believe she gained her strength of character from her mother, Elizabeth Wydeville, and her temperate manner from her father, Edward IV. Though the mother of a King and two Queens, she has always seemed to me to have been passed over by more interesting characters of her time, and yet she is the one person to whom I feel I can relate to more, simply because she had to go along with whatever other people wanted. I wonder if she was ever able to say what she really felt or was she cowed by other stronger personalities, such as her mother and her formidable mother-in-law? Her husband, (even taking into account my ‘favouritism’ towards ‘Uncle Richard’) always came across, as a man who always got his own way and who appeared to be a ‘cold fish’. My own view on their marriage is that Elizabeth simply had to agree to it, she had no choice, and I think she put all her energies into her children. I believe that Arthur and Margaret were more in character with their mother, and maternal grandfather, and that Henry and Mary had traits more in keeping with their father and paternal grandmother!! I often wonder just what Elizabeth would have thought of her son Henry. If she had lived to a ripe old age, would she or could she have had any influence on his life? I am sure she would have been so very proud of him when he was a young man, however I think his actions in later life would have devastated her. I am glad she was not around to witness his cruelty. Why do people insist Henry VII didn’t love his wife. By all historical accounts he did. The man never openly took a mistress. By all reports, he nearly died in grief at her death. As for penny pincher, he apparently bought her lion and was always paying for her over spending. His grouch ways apparently happened even more after her death.. Elizabeth saw how much grief with her mother, I suspect she willingly took a lesser rule. She was ADORED by the people and dearly beloved. Henry had lavish funeral for Elizabeth ( I believe lavish coronation) and had an event year year at the anniversary of her death. The two spent more time than they had to with each other and she would polish his armor herself. Please note: Comment moderation is currently enabled so there will be a delay between when you post your comment and when it shows up. Get your OWN image - Click HERE! It only takes a second.